The demand for fresh, all-natural, and gluten-free foods among consumers has gained prominence in recent years in various parts of the world. The rising demand for packaged soups that are sourced using natural ingredients, have loads of nutrients, and fresh in flavor and taste is a key factor propelling the demand for organic soups in the food sector. These soups are packaged so as to facilitate easy storage and allows convenience in preparation. The advent of organic soups that compare favorably with home-made soups in terms of nutrients and freshness is a crucial factor fueling the growth of the market. The rising interest among consumers in low-sodium soups and their growing proclivity for all-natural soups also containing a variety of exotic blends and flavors are key factors expected to catalyze the market throughout the forecast period. 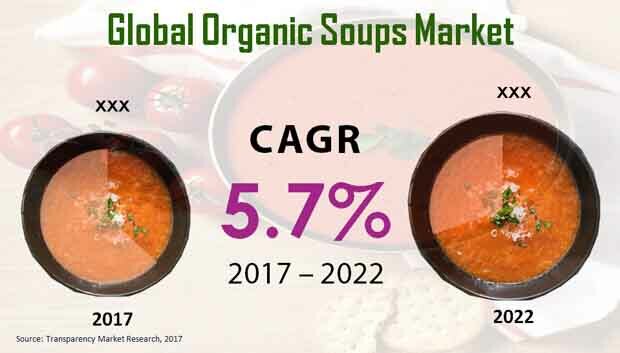 The global organic soups market estimated valuation is US$1,895.5 Mn in 2017 and is anticipated to be worth US$2,497.8 Mn by the end of 2022. Witnessing profound potential in the food retail sector in various regions, the market is estimated to expand at a CAGR of 5.7% during 2017–2022. The major product types of organic soups are soup pre-mixes, ready to serve wet soups, and condensed wet soups. Of these, the ready to serve wet soup segment accounts for the dominant share. The demand for these types of organic soups is preferred on account of easy preparation methods. Furthermore, the burgeoning demand for quick meal among families in various developing regions is a prominent trend likely to accentuate the demand. The estimated share of the segment of serve wet soup is 32.5% in 2017 or US$ 615.1 Mn of the market. The segment is projected rise at 6.1% CAGR from 2017 to 2022 and is anticipated to be worth US$ 826.9 Mn by the end of the forecast period. Expanding at US$ 42.4 Mn year-over-year over the forecast period, this signifies the leading absolute growth compared to all other segments. North America holds the major revenue in 2017 and is projected to do so throughout the forecast period. The regional market is predicted to expand at a CAGR of 6% during 2017–2022. Local distributors expanding their chains and a number of grocery retailers investing in all natural and non-GMO soups are key developments expected to offer a robust fillip to the growth of the North America market for organic soups. The APEJ organic soups market is projected to hold a revenue share of 21.5% of the global market by the end 2017 and is anticipated to gain its share by 155 BPS during 2017–2022. The Europe market for organic soups is predicted to rise at an impressive pace in the coming years. The regional market is anticipated to rise at a CAGR of 4.4% from 2017 to 2022, in terms of revenue and is anticipated to reach US$669.9 Mn by the end of the forecast period. Meanwhile Japan and MEA are also expected to witness moderate demand for organic soups. The organic soups market for Japan is estimated to rise at 4.9% during the forecast period and reach US$98.5 Mn by 2022 end. Furthermore, the MEA organic soups market is projected to register a CAGR of 4.2% during the forecast period and to reach a valuation US$ 50.7 Mn by the end of the period. Prominent players operating in the organic soup market include Campbell Soup Company, the Kraft Heinz Company, Unilever PLC, Wolfgang Puck Worldwide, Inc., Trader Joe's Company, Blount Fine Foods, Amy's Kitchen Inc., Hain Celestial Group, Kettle Cuisine, LLC., and General Mills, Inc. Several leading players are boosting their supply chains and developing sourcing strategies to gain a better foothold in the market. The report offers an elaborate assessment of key drivers and restraining factors, notable trends and prominent opportunities, share and size of various segments, and competitive landscape. The study tracks key shifts in strategies of market players along with the game-changing strategies adopted by leading players to maintain their dominance. The intensifying focus of populations world over for consuming packaged soups that are sourced naturally, high on nutritional benefits, and are convenient to store and make has been a crucial factor leading the demand for organic soups. The study provides a detailed profile of various players and analyzes key strategies adopted by major players to consolidate their shares in the coming years. Leading players profiled in the report are Campbell Soup Company, the Kraft Heinz Company, Unilever PLC, Wolfgang Puck Worldwide, Inc., Trader Joe's Company, Blount Fine Foods, Amy's Kitchen Inc., Hain Celestial Group, Kettle Cuisine, LLC., and General Mills, Inc.